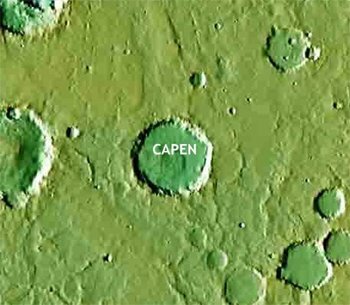 Don PARKER and Jeff BEISH communicated a pleasant news to us on 10 January that their friend and mentor Charles F "Chick" CAPEN (1926-1986) finally got a Martian crater named in his honor: "A 70 km crater on Mars, located at 6.57N, 345.73W, has been named for the American astronomer Charles F. Capen." Our season of the 2007/2008 Mars, which started in February 2007, came to an end in mid-July 2008, and our Mars Gallery was closed on 6 August 2008.